Governor Andrew M. Cuomo today announced the first officially licensed I LOVE NEW YORK beer will be distributed throughout China in partnership with New York's largest farm brewery. 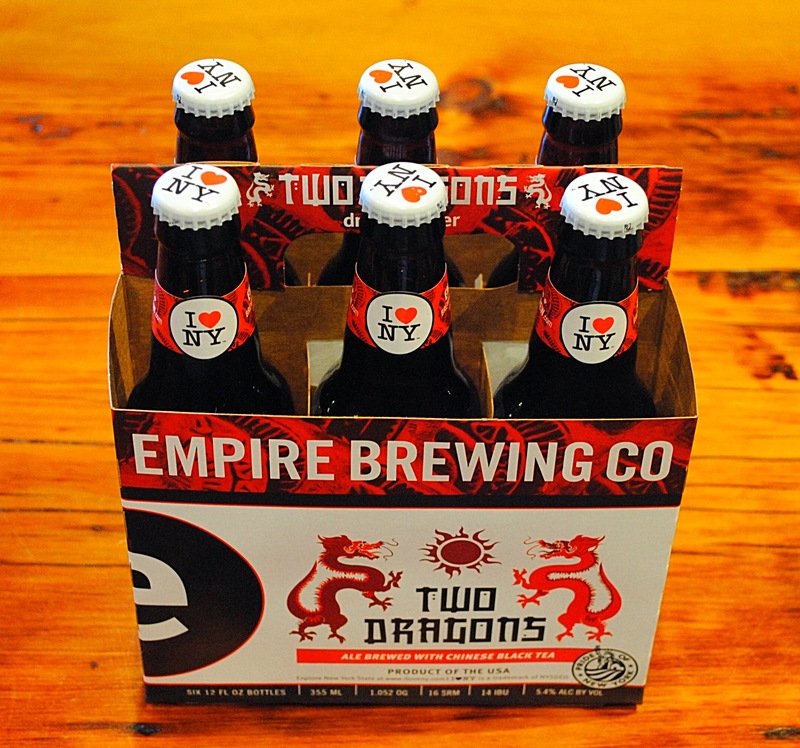 Under Syracuse-based Empire Brewing Company’s "Two Dragons" label, the beer, branded with the iconic and globally recognized I LOVE NEW YORK tourism logo, will serve as an introduction to the growing number of craft breweries and agritourism destinations in New York State. "New York's thriving, world-renowned craft beverage industry is creating new jobs and driving economic growth across the state, and this unique partnership will introduce one of our finest New York products to a global audience," Governor Cuomo said. "The iconic I LOVE NEW YORK logo will promote the high quality of New York's food and beverage products and attract more visitors to craft beverage breweries, growing the industry and increasing tourism revenue across the state." 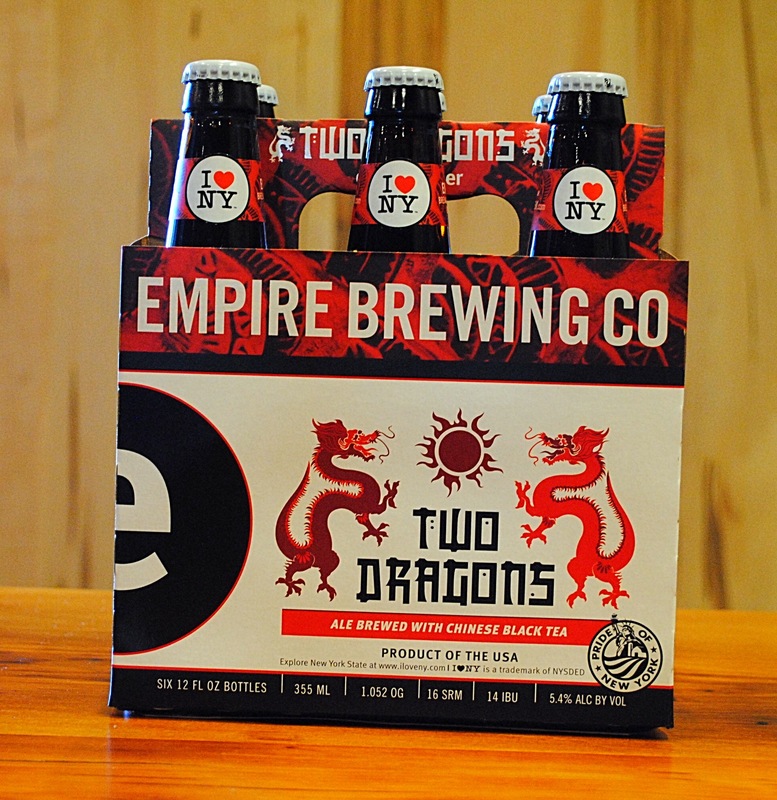 Two Dragons is an ale-style beer brewed with New York State hops and Chinese black tea. Empire Brewing Company owner David Katleski was inspired to combine the art of American Craft brewing techniques with the history and precision of Chinese tea making during a trip to China. Initially designed for the Chinese market, the beer is being distributed into Empire Brewing’s New York, New Jersey and Delaware distribution network due to high demand. Empire Brewing plans to increase circulation as the brewery grows and expands. Photos of the beer are available here, here, here and here. The production of the beer is made possible by a new brewing facility in Cazenovia, supported by state funding from the Upstate Revitalization Initiative. At 42,000 square feet, Empire Brewing Company’s new Farmstead Brewery, or the "Brewstead," is the largest farm brewery in New York State and will create nearly 80 new local jobs. The new facility enables the company to expand production from 4,500 barrels per year to 17,000 barrels in year one, and 20,000 barrels by year three. The partnership complements the progress made by the Governor over the past five years, including enacting the Craft New York Act, to cut burdensome requirements on producers and ease restrictions regarding the marketing of craft products. Since 2011, the state has implemented a number of significant reforms and expanded programs to grow the craft beverage industry, including launching a $60 million statewide promotional campaign and hosting wine, beer and spirits summits across the state. Empire Brewing Company owner and NYS Brewers Association President David Katleski said, "Our corporate philosophy is Grow Local, Craft Global and our Mission Is In The Bottle.It seemed only right that we would take this opportunity of partnering with I LOVE NEW YORK to further promote the state through our beer in China." Empire State Development President, CEO & Commissioner Howard Zemsky said, "Under the leadership of Governor Cuomo, the craft beverage industry has experienced unprecedented growth in New York State, and Empire Brewing Company has been an industry leader. Their new partnership will no doubt earn them global fans and help to expand awareness of New York State's delicious craft beverages." Empire State Development’s Global NY division has been integral in helping to establish and develop relationships between the brewery and China, and exposing the brewery to multiple overseas buyers, leading to increased exports. 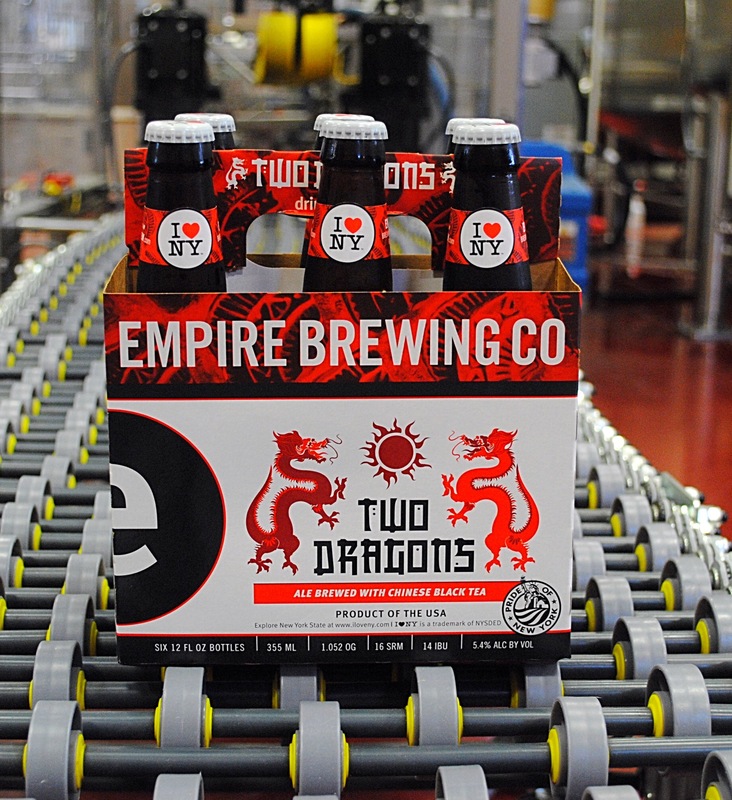 In 2015 Empire Brewing Company participated in a trade mission to China, organized and led by Empire State Development’s Global NY division, which introduced the brewery to Chinese marketing, packaging and competition. Their foreign travel costs were offset through a State Trade & Export Promotion grant. Empire State Development, New York State's chief economic development agency, has been a major supporter of Empire Brewing Company throughout the planning and construction of its Farmstead Brewery in Cazenovia, Madison County. Empire State Development provided financing and approved the company’s participation in the START-UP NY tax-free program, which includes a partnership between Empire Brewing Company and SUNY Morrisville’s Brewing Studies program. The I LOVE NEW YORK Two Dragons beer will arrive in China in February 2017. The deal was negotiated and executed by Brand Sense Partners, the exclusive licensing agency for I LOVE NEW YORK. The I LOVE NEW YORK logo is a registered trademark, with all rights owned by New York State’s Empire State Development agency. Any use of the logo without their permission is prohibited. For more information on I LOVE NEW YORK's licensing program, please contact BSP at [email protected]. New York State features 11 beautiful vacation regions. New York's attractions feature landmarks such as Niagara Falls, the largest park in the continental U.S. in the Adirondacks and treasures such as the Baseball Hall of Fame in Cooperstown and the Corning Museum of Glass. New York State offers diverse activities for all: outdoor fun - fishing, hiking and boating, year-round festivals and exploring the rich history and culture of one of the 13 original colonies. Visitors also enjoy the fine cuisine, beverage trails and farm-to-table fresh foods. For more information, visit www.iloveny.com. Media can find press releases and more at thebeat.iloveny.com.